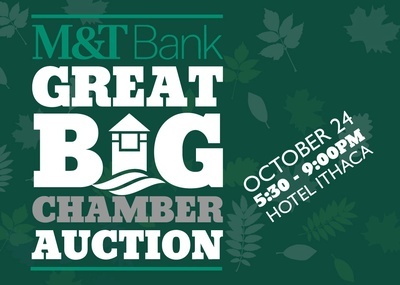 The Tompkins Chamber and M&T Bank invite you to The Great Big Chamber Auction on Wednesday October 24! Hosted by the Hotel Ithaca, this year's event will offer a bountiful display of hor d'oeuvres, specialty cocktails, and seasonal desserts. As always, we have the largest Silent Auction and Live Auction around, plus raffle, prizes and much more. The Auction event sells out each year, so reserve your ticket in advance to guarantee your spot! Tickets are $40 per person or $70 for two! Start Bidding! Visit our online Auction website. All proceeds of the Great Big Chamber Auction underwrite events and projects that benefit our Chamber members. Your support ensures that the Chamber provides valuable programs and events that serve to educate, network, promote, and support our member businesses and organizations. THANK YOU! 7:00 PM - Live Auction begins!